Hoopdance Revolution chronicles a cultural movement toward wellness. 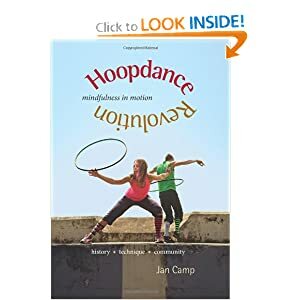 It combines the experiences of the exemplary people Jan Camp interviewed in her quest for the essence of Hoopdance at international events and through personal interaction. Having fun and being fully engaged with a challenging activity opens us to the possibility of entering a vivid, sensory world of healing and transformation. The hoop is a tool for play, physical focus, and spiritual meditation. Dancing with a hoop, spinning in spirals and drawing patterns in the space around the body intensifies the sharpens the intentions we hold in our hearts so that what we truly desire can come to pass. Jan Camp is an artist and graphic designer with an active hoopdance practice. She has contributed to three books that inspired Hoopdance Revolution, A Door in the Swamp by Joell Jones and the Fish Arm Collective (Comix Press), and Cay Lang’s Taking the Leap (Chronicle Books). A resident of Berkeley, California, Jan studied art and writing at the College of Santa Fe, San Francisco State University, and University of Chicago. Her critically acclaimed work as a visual artist is represented in art galleries all over the States and gained her a residency at the MacDowell artist colony. Together with her husband, award-winning documentary filmmaker Tom Weidlinger, Jan Camp runs Arclight Books in the SF Bay Area, a grassroots publishing group dedicated bringing local artists and authors together to share resources and participate in events. I did not know anything about Hoopdance before reading through this book. This book takes a newbie like myself and opens my eyes to the amazing array of health benefits of this. The book is full of images that show you how Hoopdance works and where it all started. The book was well organized and I have to say that I learned so much in the reading of this. I personally enjoyed reading some of the testimonials that were within this book which gave you a person view of what Hooping can do for you as a person. It was inspiring to see the physical and spiritual benefits that this can provide!